Temporariness is one of the most successful notions of the past decades. The temporary presence of art, in contrast to its isolated confinement in museum collections or its permanent occupation of public space in stone or bronze, appears to have more of a chance of becoming part of our daily lives. At first, this temporary presence focused on unusual spots outside the art circuit. Armed with maps and descriptions, large groups of art lovers visited districts and buildings in which art had never before been shown. But this form of temporariness, already suspect because of its affinity with spectacle, definitively lost the greatest part of its attractiveness when it was realized that most of the interventions not only took little interest in the grudging decor of the local population, but that the artists hastily flown in and out were also not much more than workers available at the command of the big neoliberal boss. Since then, the notion of temporariness has been stretched. A model that seems to overcome the objections, certainly when giving art a place in a community as a part of social processes is involved, is a combination of short-term projects within a longer time framework. This fits in with the realization that, while routines and traditions do exist, life does not stand still. Although daily life for most of us takes place according to fixed patterns, it is filled with chance occurrences, disruptions and changes that simply go with living in a community. At the same time, however, sweeping change is a lengthy process, and a short term project, no matter how participatory, often is no more than a fleeting diversion from daily worries. Locating the Producers revolves around five projects that take this model as their point of departure: The Blue House by Jeanne van Heeswijk in Amsterdam’s IJburg district, Creative Egremont by the Grizedale Arts organization in Cumbria, England, Trekroner Art Plan in Roskilde, Denmark, the Edgware Road Project in London and Beyond in Leidsche Rijn near Utrecht in the Netherlands. All of these projects are of long duration and characterized by a great involvement with the area in which they occur. Moreover, they strive to collaborate with the residents/users. And all of the selected projects are supported by an artist/organizer/curator who guarantees their long duration and forms the permanent factor underlying the changing and shifting layer of temporary works, processes and projects. But there the similarity ends. For while some of these ventures take place in newly developed areas where the organization has to diligently search for residents who are not yet present, others are specifically aimed at regenerating neighbourhoods that have fallen into decline. What finally comes about over the course of many years is sometimes hidden behind a vague term like ‘art related’, while in the case of Beyond, for instance, which had an apotheosis in the form of a sculpture park, there is actually a question of works that are clearly recognizable as art. That difference is one of the book’s strongest points, for it shows how diverse this practice is, how many different forms this way of working can take and how many possibilities there are. However, the painstaking descriptions of these projects also make clear how laborious these sorts of processes often are, and how often original plans have to be revised. The book was written from the inside. The team that did the research, headed up by Paul O’Neill, followed the projects very closely, asked difficult questions, and in that way had an influence on how things went. Such an approach is also fitting for this form of art. Work that takes time to develop, in which research and process development play an important role, cannot simply be described or analysed from a distance. In that sense, the book is just as post-critical as the art production it scrutinizes. The projects want to make a contribution, each in their own manner, to the place they focus upon. In doing so, they maintain a precarious balance between adaptation and agony, but usually there is no question of taking a critical outsider’s position. The pursuance of embedding does not permit that. When it does occur, for example with the exhibition ‘In Pursuit of Happiness’, which is part of Beyond, contact with the local population is totally absent. The book also pays somewhat for that lack of distance. 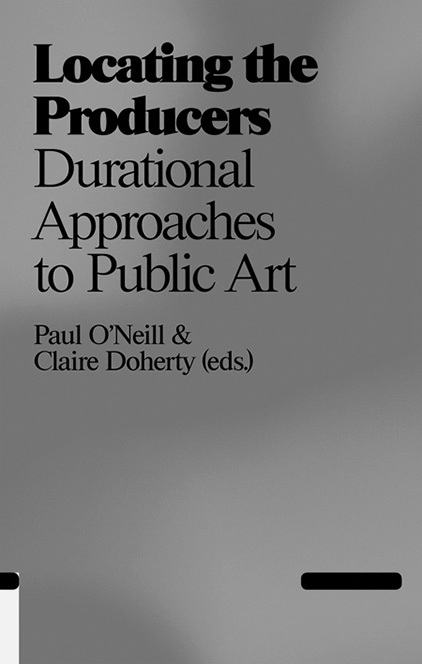 Although a number of short essays by Mick Wilson, Dave Beech and Ned Rossiter comment on some of the central principles of this approach, the book primarily rests on the descriptions of the projects. Owing to O’Neill’s understanding and his feeling for nuances and problems, while at the same time attempting to avoid the all-too-cheerful prose with which organizers keep their subsidizers satisfied, the sharpness and pleasure are lacking. The texts read like an exhaustive account of an extremely long party that the reader has nothing to do with. Visually, too, except for a cd-rom with all of the works of Beyond, the book does not have much to offer. That is a predominant characteristic of this sort of lengthy project, oriented especially towards participation. If you were not there in person, you have to make do with the photographs, and they generally show, as the highpoint, a number of people sitting around a table, deeply concentrated on the question of how to go on from here. That raises the question of what actually remains of these long-running ventures. What has happened, what has been accomplished, what changes have taken place? The effects, and certainly the affects, are difficult to measure. In his essay, Mick Wilson offers the possibility that this is about ‘discursive exhibitions’ that do not end with the ending of the project but keep developing over the course of time. That might be so, but I wouldn’t know exactly who this ‘discursive exhibition’ is meant for. While the happenings, events, processions, parades, art manifestations and gatherings do their best to be as accessible and understandable as possible, the considerations and intentions that underlie them are quite impenetrable. Just as with many forms of artistic research, the increased servitude of the artistic work seems to have to be compensated for by an equally great increase of ‘discursive distance’. The question of what these projects actually produce is not so much aimed at their tangible results in the sense of successful works of art or communities charged with new energy. The criteria for this are still lacking, and perhaps that question is also not the most important. However, it is interesting to know whether the objective that motivates these projects has been realized. For if this is about giving art a different place in the community, letting it play a different role in the daily lives of groups and individuals for whom art usually does not have much to offer, then the result should be a recognition of that new position. If art chooses the ethical principle of wanting to make a contribution to the daily struggle of existence, then you may expect that something like this is also seen as a contribution by society. For the time being, however, in the Netherlands at least, there doesn’t seem to be any open, social appreciation for this intensive and lengthy effort on the part of art and artists.